Bay windows consist of three windows that expand outward from your home to create a well-lit space that can be used as a comfortable nook for reading, eating breakfast, or other activity that makes a house a home. Typically, the center window is stationary while the two side windows open to allow a breeze into the room. 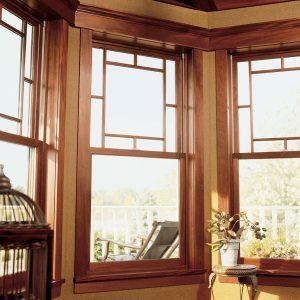 If you’ve always wanted to highlight the living area in your home in Louisville, Kentucky, or a nearby city, with bay windows, turn to the specialists at Windows Plus. Windows Plus is proud to offer our valued customers in Louisville and throughout Kentuckiana high-quality bay windows from some of the most respected manufacturers in the industry, such as Infinity from Marvin and Pella. You’ll be able to choose from composite, fiberglass, or wood-clad frames, all of which are customizable by color, texture, and hardware options. Because bay windows contain more glass than standard windows, you may want to consider energy-efficient vinyl-frame windows from our own Energy Wall collection. These windows contain double or triple panes of Low-E glass and other features that will better insulate your home and potentially lower your monthly energy bills. At Windows Plus, our installers are factory-trained specialists in their field. Their knowledge of bay window replacement best practices is virtually unmatched, and you can expect nothing but top-tier craftsmanship from them at every step of the installation. For peace of mind, we’ll back your bay windows with a lifetime warranty, ensuring long-lasting protection for your investment. Are you ready to update your home in the Louisville, KY, metropolitan area with gorgeous bay windows? If so, we’re waiting to hear from you! Contact Windows Plus today.